St. Margaret Clitherow, "the Pearl of York"
I just recently moved from a home I'd lived in for forty years. While I was packing up, I ran across a card I had received many years ago (many years ago) from a friend who was spending a sabbatical year in England--I'd tossed it into my bill basket, where it remained. Every once in a while, when I "cleaned" out the basket, I'd come across it, but there it remained. 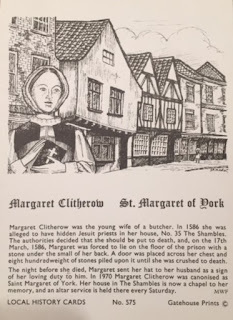 The card told the story of Margaret Clitherow, also known as St. Margaret of York. Since the card itself is quite small, postcard-sized, and since half of it is taken up with an illustration, there isn't much text on it. I'd always assumed that this was a postcard, in fact, but when I looked at it carefully this last July, trying to decide what to keep and what to toss after living four decades in the same space, I realized it wasn't a postcard after all. It was something called a "Local History Card." And this was card No. 575. I decided not only to keep the card but, finally, to do something with it. And thus today's post. Margaret Middleton was born in 1555 or 1556, the daughter of John Middleton, sheriff of York (1564-65), and his wife, Jane. When Margaret was fourteen years old, her father died; the next year, in 1571, she married John Clitherow. Like her father, who had been a successful businessman (a chandler, or candlemaker), Clitherow was also a successful tradesman, a butcher. Also like her father, John Clitherow had a civic role, in his case as a chamberlain for the city, a kind of treasurer responsible for receiving rents and revenues--and he also had the responsibility of reporting the activities of Catholics to the Church of England parish authorities. Margaret and her husband lived in the Shambles, a street where butchers had their homes and shops--today, the Shambles preserves its overhanging, medieval timber-frame structures, making it a popular tourist site in the city of York. At some point in the 1570s, perhaps in 1574, according to some accounts, Margaret converted to Catholicism. The Middleton family, whatever their religious faith before Elizabeth Tudor came to the throne, seems to have accepted the Protestant faith--John Middleton had become sheriff of the city of York in 1564, six years after Elizabeth's accession. Margaret was fined for not attending church. Her husband paid her fines. Margaret raised their children as Catholics. Her husband did not object. Margaret opened her home to a priest who said the mass for her. Her husband turned a blind eye. 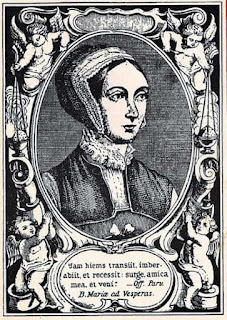 Margaret was first imprisoned for failure to attend church services (Church of England) in 1577 (the parish register notes that she is "great with child," and this may be when she gave birth to her third child, a boy named William, who is said to have been born when she was incarcerated). 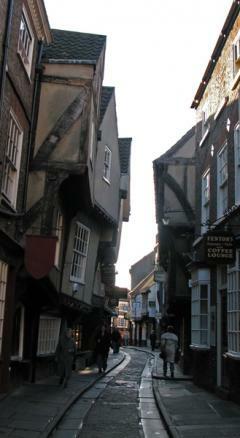 She was then arrested twice more, in 1580 (she was released from prison in 1581 in order to give birth) and 1583. As a result of this third arrest, she spent some twenty months in prison. It may have been during this last, extended imprisonment that she learned to read and to write. 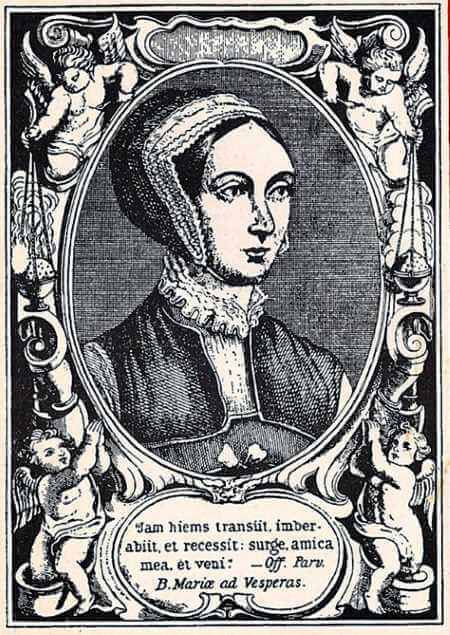 But when she was arrested on 10 March 1586, it was for more than failure to attend church services. John Clitherow had been called before the Council of the North to explain the absence of his son Henry--whom Margaret had sent to the continent to be educated at the English College in Rheims. John Clitherow refused to provide any information about his son's whereabouts, and so the authorities searched his home. 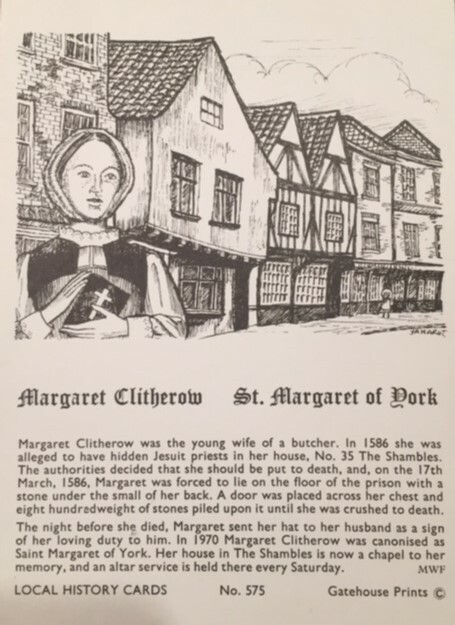 There, one of the frightened Clitherow servants revealed to authorities the existence of a priest hole, a secret room where Margaret had hidden priests. Although there were no men hiding there when the house was searched, authorities found ample evidence to arrest Margaret--there were vestments and bread left from the Mass. Margaret was arraigned four days later, on 14 March 1586, by the Council of the North at the York Assizes, charged with the crime of having "harbored and maintained Jesuits and seminary priests, traitors to the Queen's majesty and her laws." In response to the charges read against her, Margaret reportedly said, "I know of no offense whereof I should confess myself guilty. Having made no offense, I need no trial." Margaret refused to plead to the charges made against her, presumably because, if she had cooperated and then been brought to trial, her children would have been used as witnesses against her. You must return from whence you came, and there, in the lowest part of the prison, be stripped naked, laid down, your back on the ground, and as much weight laid upon you as you are able to bear, and so to continue for three days without meat or drink, and on the third day to be pressed to death, your hands and feet tied to posts, and a sharp stone under your back. To this dreadful sentence, Margaret Clitherow reportedly replied, "God be thanked, I am not worthy of so good a death as this." Perhaps in the hope that she would relent--she was believed to be pregnant again--ten days elapsed between the time she was sentenced and the day she was executed. Although she was probably with child, this horrible sentence was carried out on Lady Day, 1586 (Good Friday according to New Style). She had endured an agony of fear the previous night, but was now calm, joyous, and smiling. She walked barefooted to the tollbooth on Ousebridge, for she had sent her hose and shoes to her daughter Anne, in token that she should follow in her steps. She had been tormented by the ministers and even now was urged to confess her crimes. "No, no, Mr. Sheriff, I die for the love of my Lord Jesu," she answered. She was laid on the ground, a sharp stone beneath her back, her hands stretched out in the form of a cross and bound to two posts. Then a door was placed upon her, which was weighted down till she was crushed to death. Her last words during an agony of fifteen minutes, were "Jesu! Jesu! Jesu! have mercy on me!" 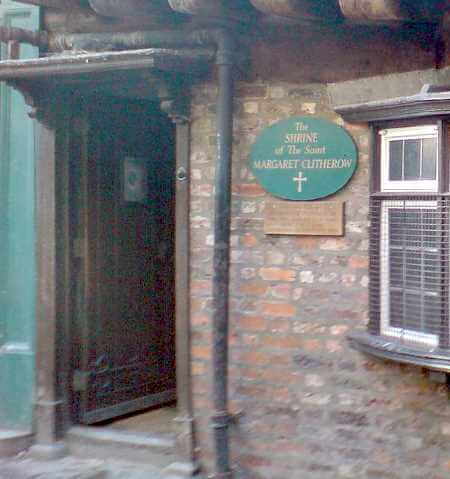 There is now a shrine for Margaret Clitherow, St. Margaret of York, in her former home, 35-36 Shambles. According to my Local History Card, "an altar service is held there every Saturday."